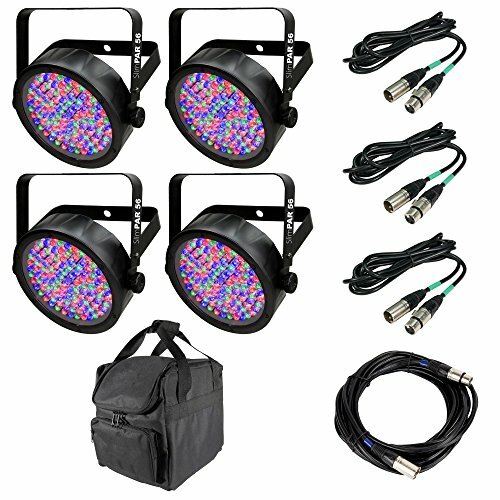 This package includes 4 SlimPar 56 LED lights, a 25-foot and 3 10-foot female-to-male DMX cables, and a carry bag. The Chauvet Slimpar 56 is a LED PAR can housed in a casing that is only 2 inches thick, which allows it to go where other PAR cans don't fit. Powered by 108 red, green, and blue LEDs, the fixture offers 3- or 7-channels of DMX control. It also provides static colors and RGB color mixing with or without DMX, built-in automated and sound activated programs and a variable speed pulse effect. The Slimpar 56 is compatible for use with the Satellite battery-operated system. It's great for quiet installations thanks to its 100% silent operation and lack of moving parts. Create static colors and RGB color mixing without a DMX controller using the Slimpar 56. The Chauvet DMX Cable ensures your equipment works at optimal levels at every gig you put on. These DMX cables are made specifically for lighting. The 25-foot long cable and 3 10-foot cables have an impedance of 117 Ohms, displays a male to female connector with 3 pins, and meets all standards of suitability and quality to provide safety, shielding, and to prevent transmission interferences. The VIP Gear Bag was custom made to house and carry SlimPAR fixtures. Up to 4 SlimPAR wash lights will fit alongside an Obey 3 controller and cables to connect the system together. It's a complete mobile lighting setup in one convenient carrying case ideal for musicians, mobile DJs, and small venues. This soft bag is a great way to transport a small light show from venue to venue. The 5 internal compartments and 2 external compartments hold lots of accessories for entertainers on-the-go.